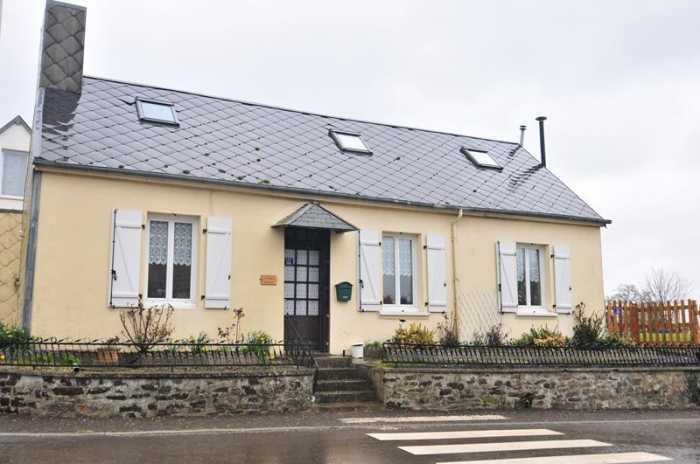 Properties for sale in Normandy, France - AHIN-SIF-00I003 Moncy Nr Vassy 61800 Low-maintenance village house in Normandy with garden and garage. AHIN-SIF-00I003 Moncy Nr Vassy 61800 Low-maintenance village house in Normandy with garden and garage. Opportunity to buy a renovated detached house in a village centre within a short level walk to bar/restaurant/shop. The property benefits from a downstairs bedroom and shower room, double glazed windows with shutters and an attractive enclosed garden. Ideal as a holiday home or for retirement. Viewing is recommended. The property is about 3km from Vassy, an attractive market town providing a comprehensive range of shops including a bank, supermarket, butcher, bakers, pharmacy, local doctor and dentist, petrol station, etc. Vire, a larger town, is 17km away and has a mainline train station to Paris (2 hours 40 minutes). The Normandy landing beaches, are within an hour's drive. The pretty town of Clécy on the river Orne in the Swiss Normandy area is only 20 minutes away with Golf Course, kayaking, fishing, etc. The nearest ferry port is 60km at Caen Ouistreham and nearest airports are at Caen Carpiquet and Dinard. Open plan Kitchen/Living Room 7.7 x 4.94m - Part glazed door and 2 windows to front elevation. Stairs to first floor. Range of matching white base and wall units. Space and plumbing for washing machine and dishwasher. Built in electric oven and 4 ring electric hob with extractor hood over. Cupboard housing wall mounted gas combi boiler. 1 1/4 sink unit with mixer tap. Built-in fridge. 2 radiators. Central heating thermostat. Part laminate and part-tiled floor. Coving. Inner Hall Partly glazed door to garden. Heated towel rail. Tiled floor. Cupboard. Bedroom 1 3.6 x 3.48m - Fireplace with wood-burner. Window to front elevation. Radiator. Laminate flooring. Shower Room 2.79 x 1.71m - Under floor heating. Extractor. Obscure glazed window to rear elevation. Large shower. WC. Vanity unit. Tiled walls and floor. Inset spotlights. Dining Room 4 x 3.24m - Laminate flooring. Radiator. Window to east elevation. Coving. Door to garage. Mezzanine 4.26 x 2.2m - Velux window to front elevation. Laminate flooring. Under eaves storage. Radiator. Exposed ~”A” frame. Sloping ceilings. En-Suite Bathroom 3.73 x 2.2m - Under eaves storage. WC. Bath with mixer tap/shower fitment. Vanity unit. Velux window to front and window to east elevations. Heated towel rail. Inset spotlights. Vent. Under floor heating. Door to Juliette balcony to east elevation. Attached Garage 6.68 x 2.88m - Sliding PVC door. Concrete floor. Power and light. Fully enclosed garden laid to lawn with flower and shrub borders. 2 tiled terrace areas. Vegetable plot. Mains water, electricity and telephone. Drainage is to an all water septic tank installed in about 2016. Gas fired central heating. Please note : There is no Energy Rating for this property because the owners do not have 3 years' bills for energy consumption for full time occupation.